Daniel Amen, M.D., one of the world's foremost authorities on the brain, has news for you: your brain is involved in everything you do -- learn to care for it properly, and you will be smarter, healthier, and happier in as little as 15 days! You probably run, lift weights, or do yoga to keep your body in great shape; you put on sunscreen and lotions to protect your skin; but chances are you simply ignore your brain and trust it to do its job. People unknowingly endanger or injure their brains, stress them by working at a frenzied pace and not getting enough sleep, pollute them with caffeine, alcohol, and drugs, and deprive them of proper nutrients. Brain dysfunction is the number one reason people fail at school, work, and relationships. The brain is the organ of learning, working, and loving -- the supercomputer that runs our lives. It's very simple: when our brains work right, we work right -- and when our brains have trouble, we have trouble in our lives. 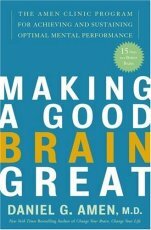 Full of encouraging anecdotes from Dr. Amen's many years of experience, Making a Good Brain Great is a positive and practical road map for enriching and improving your own greatest asset -- your brain.